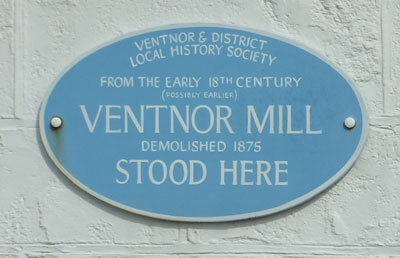 A watermill at Ventnor is known to have existed since medieval time although little details are know of the early times. It does appear on maps from 1759 and is known to have suffered a serious fire in the 1840's. However, it was obviously rebuilt as the 1861 census shows Matthias John Roberts as Miller in Mill Street. The mill was demolished in 1875 and the site redeveloped - the row of villas which form Alexandra Gardens was built on the main site of the mill. The stream which fed the mill was routed underground and today feeds the Cascade.